Your Work Group leader will send you the payment schedule. Our preference is that you send a check (made out to Seeds of Learning) to the address below. Please be sure to put the volunteer’s name in the memo line of the check. SOL offers financial assistance to Work Group volunteers through two memorial scholarship funds for qualifying individuals. We also offer help to individuals and groups who want to fundraise for their trip. Individual volunteers may only be granted at most one scholarship per year. The scholarship deadline for 2019 work group scholarships is April 15th, 2019. However, we would be glad to help support individuals who need financial assistance with ideas, suggestions, and administrative support for their fundraising. Please contact info@seedsoflearning.org with any questions. Residents of Sonoma County under the age of 18 may be eligible to apply for the Douglas Thompson Memorial Scholarship. Individuals who are 30 years of age or younger may be eligible to apply for the Matt Schekel Scholarship. Teachers who wish to travel with Seeds of Learning may be eligible to apply for the Teacher Work Group Scholarship Program. SOL encourages ALL Work Group volunteers (especially those who apply for a scholarship) who need financial assistance to download and personalize this sample fundraising letter. You can send it to friends, relatives, church members, school teachers, etc. Volunteers have found it helpful to suggest a donation of $50 or so from each person to whom they send it. Many volunteers have also found it helpful to describe their trip and what the experience means to them and to personalize the letter. Take special care to replace the appropriate text with information unique to your trip. When requesting donations in support of your work group trip, please be sure to let donors know that SOL thanks and adds all donors to its mailing list unless requested otherwise. If you are a U.S. taxpayer, you are eligible for out of pocket savings for our volunteer service program. 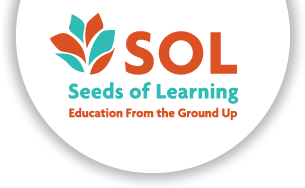 The service program fees, air fare, visa, and related travel expenses are tax deductible if the participant adheres to SOL’s program itinerary, because they perform the work of Seeds of Learning, a 501c3 tax-exempt organization. (See IRS Form 526) . Our trips adhere to IRS requirements that participants work, on average, eight hours per day, six days out of nine (or five out of seven) to ensure this tax benefit. We can provide a detailed itinerary to this effect; however, we also recommend you keep a personal journal detailing the hours you work for tax purposes. Those interested in claiming this benefit will need to consult a personal tax advisor for tax-deductibility advice. Please note: additional travel or vacation either before or after the service program may disqualify all or part of your service program fee, air fare, etc., from this tax deduction.